How do you spell sensory overload? Too, too much! Computer Generated Imaging is fine if it augments a good story, but there was so much CGI in this mess that the uninitiated (ME!) couldn't decipher the plot. Of course there are the good guys and the bad guys, but sometimes even the good guys were sorta bad. And some of the bad guys were even worse! Clearly, I am NOT a member of the target audience for this one, so much of it went over my head. From the conversations overheard in the lobby as we exited the screening, the best-informed audience members were the ones who had read the graphic novels. * Chris Hemsworth ("Rush") is Thor, back to save the universe. 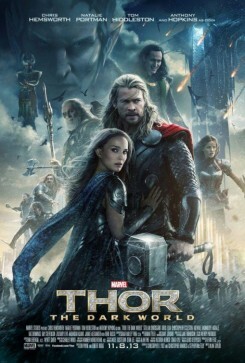 * Natalie Portman ("The Other Boleyn Girl") returns as Jane Foster, the scientist he left behind...once. * Tom Hiddleston ("The Avengers") is resurrected as Loki, the bad brother nobody likes! Remember what The Hulk did to him? We LOVED that! * Stellan Skarsgård ("Romeo and Juliet") is back as Dr. Eric Selvig, the man we first see running naked on a TV news broadcast. His lecture on the convergence of the planets is received by a singularly bored class ...of senior citizens. * Idris Elba ("Prometheus" and "Luther") is a new face to this franchise, at least he is on our side! * Ray Stevenson ("Rome") is Thor's right-hand man. * Kat Dennings ("Thor") is back as Darcy, who provides the too-scarce comic relief. I found myself longing for anything with her in it because I could relax a bit and laugh. A word to the wise: The patented Marvel Comics "teaser" comes just before the closing credits, but if you are patient and sit through an endless scroll of technicians involved in this project, there is a second teaser!